Have you configured Alternate Access Mappings for this site? Can you connect to site before? Try to connect to another site and check the results. If all sites cannot be connected, please make sure you enable the feature “SharePoint Server Enterprise Site Collection features” on all relevant site collection-level and site-level. Also do not forget to try the solution mentioned above(under your question). Not the answer you're looking for? Browse other questions tagged 2013 sharepoint-server infopath or ask your own question. 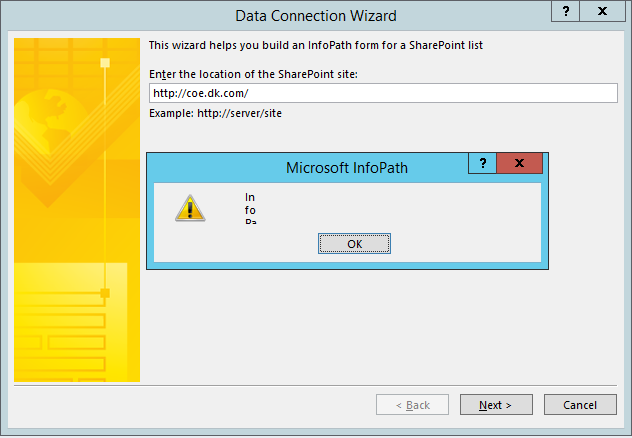 How to publish/update Infopath form 2013 of SharePoint List?